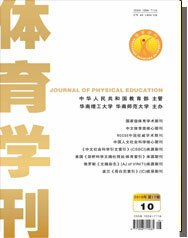 Abstract:Using the approaches of Cluster Analysis,Regression and Principal Component,in this paper,the authors analyze six morphologic,functional,and physical indices(length, perimeter, functions of the heart, flexility, adipose content,and muscular strength) of the female college students and their influences on the scores of the standing long jump (SLJ) without any special training. Then, with Pearson Correlation Analysis, the correlations among the six indices of the female college students are discussed. The different contributions of the six indices to the scores of SLJ are compared, which is theoretically helpful to the scientific training of SLJ.